A political has-been and a cowardly keyboard warrior exhorting Singaporeans to riot from the comfort of his home in California. This is in response to an article by Gopalan Nair in singaporedissident. I don’t normally give two hoots to political has-beens and axe-grinders. But this article is worth a little bit of attention just to show the standard of political opposition that we have presently; the type that still lives in the past, sprouting irrelevant and old issues. The type that is bitter. The type that is devoid of any alternative ideas. The cowards. Gopalan Nair was a JBJ wannabe. But unlike JBJ, Gopalan is a whimp. At the slightest sign of distress, he scooted off and became a US citizen leaving JBJ to fight the good fight. You can read more about his shenanigans by just googling his name. He calls Singaporeans cowards because they are afraid to turn against what he terms as dictatorship. He then exhorts Singaporeans to riot on the streets and create chaos to topple the present government. Why? Because, and this is worth repeating, he deems the government as a dictatorship. Today, the whole world is talking and concerned about terrorism and religious fanaticism. There is a new bogeyman. So for someone to still use dictatorship as a bogeyman just goes to show that he is out of touch, still living in the past and old. It is like a mother who chides his child by saying “don’t be naughty or I will call the karung guni man (rag-and-bone man) to get you.” The child is going to ask, “what is a karunguni man?” But try threatening the child that his iPad or internet will be taken away from him, and watch him cry. Nobody bothers about dictatorship now. The world’s biggest dictatorship, China is embraced and courted by all because of its financial might. The gulf states are all ruled by dictators. And so are a few ASEAN countries such as Thailand and Myanmar. The US has recently normalized relations with Cuba. And the only reason why North Korea is shunned is because well, they wanted to be shunned. Gopalan Nair should realise that the world has evolved. It is no longer about ideological schism now. It is all about pragmatism and economic progress. And now Gopalan Nair wants us to riot. He is threatening to take away our iPads and internet. Let’s face it. No companies will invest in an unstable country. They cannot make money. Fact. And we will lose our jobs. We may lose our homes. And without any hinterland to run to, where can we go? We may end up becoming migrant workers in other countries. These are not bogeymen. They are real risks. But most importantly, who have we got to replace the present government? Chee Soon Juan? Low Thia Khiang? Kenneth Jeyeratnam? Close your eyes and imagine anyone of them as the Prime Minister. Gopalan Nair doesn’t care about all this. 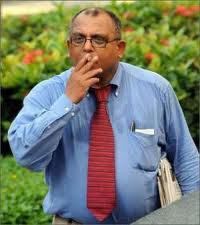 He is no longer a Singapore citizen. He is now living in California. If he truly believes in what he says, then he should return to Singapore and lead the protest. But to incite trouble knowing that he does not have anything to lose makes him the biggest coward of all.